Alfred Joseph Blood was born in Wolverhampton in 1869. He was the son of John (a railway worker) and Mary Ann Blood. In 1871 Alfred was living at 13 Grimstone Street with his parents and sisters, Mary Ann and Elizabeth. By 1881, they had moved to 82 Wednesfield Road, and the family were joined by an additional daughter, Agnes, and four sons, George, Charles, Bert and an unnamed baby aged 14 days. Alfred married Floribel Dunn in 1899, and the couple moved to 92 Pool Street. By 1911, they were living at 127 Merridale Street West with four of their children. In all, they went on to have eight children between 1902 and 1920 – John, Agnes (who unfortunately died a few months later), Alfred Joseph, Alfreda, Clara, Albert, Daniel and Ralph. Alfred enlisted in the 34th and 55th Border Regiment on 5 November 1888 (number 2604). He served in Malta, the East Indies and South Africa. In 1902 he was in hospital in the Transvaal (South Africa) with pheibitis. On being discharged later that year, Alfred signed a declaration to the effect that he was willing to remain on the Army Reserve to be called for service in the event of further conflicts. Thus, he re-enlisted into the Border Regiment at the age of 45 on 30 September 1914 (number 5604). During this service he was promoted to Lance Corporal. He survived the war and was discharged on 19 January 1919. He died in 1931 at the age of 62. William Thomas East was born in Wolverhampton in 1895, the son of Thomas and Harriet Alice East. He attended St Paul’s School, Merridale Street, and later worked at Northwood’s in Darlington Street. During the second week of the outbreak of the First World War, William enlisted in the 7th Battalion of the South Staffordshire Regiment (number 10122) and became a Signaller. He died in hospital abroad on 21 November 1915, at the age of 21. By this date, his parents resided at 5 Ablow Street. He is commemorated at the Portianos Military Cemetery in Greece, as well as on the war memorial of St Paul’s Church. The son of Samuel and Elizabeth Thomas, Samuel was born in 1898. In 1901, he was living with his parents in Sedgley. By 1911 they were living at 1 Rounds Row, Highfield Road, Bradley, Bilston, and Samuel had gained four brothers – Alfred, Harry, George and Albert. Samuel was working at an iron foundry. 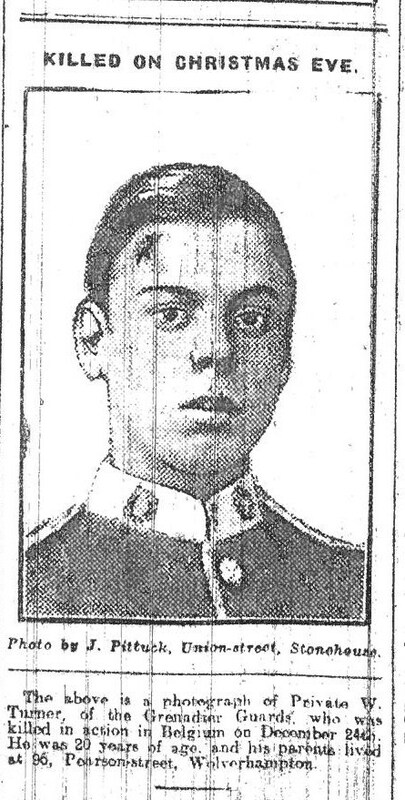 Samuel enlisted as a Private with the North Staffordshire Regiment (number 65217). On 27 March 1919, he died at the Military Hospital at Clipstone in Nottinghamshire. He is buried at Coseley (Christ Church) Old Churchyard. Another name on the Mander Brothers Ltd memorial is that of Sidney C. Davies. He was born in Wolverhampton in 1888, the fourth son of Thomas and Ellen Davies. His mother, Ellen, passed away in 1903. By the time of the 1911 census he was employed as a varnish maker at Mander Brothers Ltd, and was a boarder at Wells Lane, Wednesfield, home of his foreman, Roger Manning. His father was living at 115 Powell Street, Wolverhampton, with Sidney’s older brother. Sidney married Evelyn Jebbett in Wolverhampton in 1915 and they had a son, Harold, born the same year. Sidney enlisted with the 1st/7th Battalion of the Black Watch (Royal Highlanders) Regiment (service number 291983). Unfortunately, he was wounded, and died of those wounds on 27 September 1917. He is buried at Etaples Military Cemetery in France. Alfred Edwin Collins was born in 1880, the son of Benjamin and Julia Collins. In 1901, the family were living at 10 Brunswick Street, by which date Alfred was a general labourer. Also at the property were his sisters, Lucy and Sarah. Alfred married Lydia Maud New in 1902, and the couple moved to 2 Court, 3 House, Bagnall Street, Springfields. At some point, Alfred worked for Mander Brothers Limited. Alfred enlisted in the 4th Battalion of the South Staffordshire Regiment (number 9663). Unfortunately he was killed on 15 July 1918. He is commemorated at the Terlincthun British Cemetery, Wimille, in France. He is also listed on the Springfields Roll of Honour and the Mander Brothers memorial. He is possibly also on the Monmoor & Victoria Works memorial, but it is not clear whether this is the same man. The Express & Star of 23 January 1915 told of a curious coincidence. Two men, Albert Hayward and Frederick Horace Evans had long been “fast friends, having both married into the same family. Both men had enlisted with the South Staffordshire Regiment on 3 August 1914 and their absence had led both wives to return to their parents’ home at 31 Raglan Street. On Christmas Day 1914, both wives gave birth, Mrs Hayward to a girl and Mrs Evans to a boy. Coincidentally, around the same time as the children were born, it later transpired that the two husbands, who had been parted for some time, met in the same trench in Belgium. Albert Hayward was born in about 1893, the son Joseph and Charlotte Hayward, of 19, Coven Street, Cannock Road. He married May M. Carter in 1914. Their daughter was Christina M. Haywayd. Frederick Horace Evans was born in Wolverhampton in 1891, and married Rose E. Carter in 1912. Their son was Christoper F. Evans. The Express & Star article quotes Mrs Carter as saying “It was a lively Christmas for us, I can assure you,” while she shows off the two babies. Her husband casts his mind to the two men at the Front, hoping that “they may live to enjoy their Chrismas presents.” Unfortunately, this was not to be. Albert Hayward was killed on 28 March 1917 at the age of 24. He is commemorated at the Arras Memorial in France. Frederick Evans, however, appears to have survived the war. On 27 December 1915, a charity football match was held at the Molineux Grounds, in aid of the General Hospital, the Express & Star Tobaco Fund, the Express & Star and Mr J. B. Dumbell’s Soldiers and Prisoners Comforts Fund, and the Mayor’s War Charities Fund. A. Groves’s XI: Moorwood (Albion); J. Smith (Albion); T. Lyons (Aston Villa); Waterhouse (Albion); Groves (Wolves); McNeal (Albion); Garbutt (Stourbridge); Crossley (Sunderland); Stevens (Hull City); Halligan (Manchester United); and Wootton (Walsall). One of the Groves players (Whittingham of Stoke) was unable to play, due to missing his train, so he was replaced by Garbutt of Stourbridge. The match was refereed by Councillor A. Oakley. Prior to the game, a group of Scouts procession through the centre of town, collecting money for the benefit of prisoners of war, and there was a further collection for the same cause at Half Time. In front of a crowd of 15,000, the Bishop’s XI won 3-1, and the match raised £469 1s. 2d. for the respective charities. Merry Christmas to all our readers from all at Wolverhampton Archives & Local Studies! The photograph that appears under this headline in the Express & Star on 10 January 1915 is that of Private William James Turner, of the Grenadier Guards, who was killed in action in Belgium on 24 December 1914, a hundred years ago today. William James Turner was born in Wolverhampton in 1894, the son of John and Ada Turner. In the 1901 census, he was living at 16 Graiseley Street with his parents, his grandfather (also John), his sister (Ada Gladys) and brother (another John). He enlisted in the 2nd Battalion of the Grenadier Guards (number 16220), but, as the newspaper article states, he was unfortunately killed on Christmas Eve 1914 at the age of 20. By this date his parents were living at 96 Pearson Street. He is commemorated at the Le Touret Memorial in France, as well as possibly on the St John’s Church war memorial and/or the St Chad and St Mark’s Church war memorials (both simply say “W. Turner”). Joseph Mytton was born in 1890 in Tettenhall, the son of Edwin and Mary Mytton, of 2 Shaw Lane, Tettenhall Wood. In the 1901 census Joseph and his family were living at 28 School Road, Tettenhall, with the census recording that he was born at Pattingham. He was living with his parents and two older brothers William and Robert, two older sisters Sarah and Mary and a younger brother Edwin. In the 1911 Census Edwin and Mary were living at 3 Shaw Lane Tettenhall, the only child living with them being Joseph’s brother William who was recorded as being aged 26. In the 1911 Census a Joseph Mytton is recorded with the correct age and being born at Claverley serving with the 1st Battalion South Staffordshire Regiment based at that time in either Cyprus or Gibraltar. No Joseph Mytton served with the South Staffords during the Great War presumably this is the same man and he probably left the Army and then re-joined at the beginning of the war. When war broke out, he enlisted with the Royal Garrison Artillery (number 50941) and became a member of the 21st Trench Mortar Battery. On 27 April 1916, he died of wounds received in action. 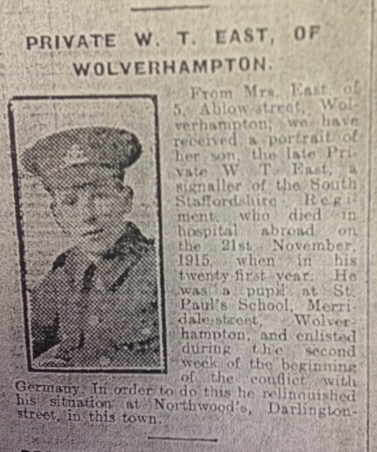 He appeared in a list of “Midland Men in Casualty Lists” in the Express & Star on 20 May 1916. He is commemorated at the Bethune Town Cemetery in France. His mother, Mary, died aged 69 in 1920. Ernest James Saunders was born in Portobello in 1893, the son of James and Louisa Saunders. By 1901, the family were living at 48 Great Hampton Street, and the household consisted of Ernest and his parents, as well as his brothers, Edward and Percy, sisters Eva and Maud, and a visitor, Edward Smith. James Saunders was a file cutter. At some point, James Saunders presumably died, or perhaps the couple got divorced, but I have found no record of this. Either way, Louisa Saunders remarried to an Alfred Price in 1917. Mrs. Price, 319, Newhampton road West, Wolverhampton, received news today (Tuesday) that her son, Private Ernest James Saunders, Sherwood Foresters, is reported missing. The private was at the relief of Kut, and afterwards went to France. Ernest did survive the war; he was officially discharged to the “Z list” on 23 March 1919. There is an Ernest Saunders who marries an Olive W. Willett in Wolverhampton in 1920, and they go on to have a daughter, Dorothy, in 1922. It is possible that this is the man in question.